The Brunswick company was founded in 1845 by John Moses Brunswick. The company started out with a reputation for building carriages. Mr. Brunswick then saw an opportunity to build a billiards pool table. By 1850, Brunswick had built his first pool table and was starting to make a name for himself in the industry. Today, Brunswick is the top billiards table manufacturer in the US and is known for extremely high quality pool tables, game room furniture, ping pong, air hockey, shuffleboard, golf and other accessories. They actually invented the first air hockey table in the 1970s. 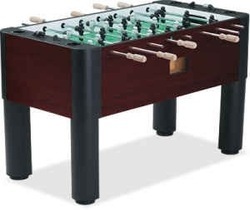 The Brunswick company currently manufactures 3 different foosball table models, though it is not the primary focus of the company and is not a huge source of revenue for the company.